Shah NH*, Adsul SD**, Paranjpe S***. Round ligament leiomyoma is a very rare site for a huge fibroid. As the overall incidence of a round ligament fibroid is very rare, it creates diagnostic difficulties as it can mimic an ovarian tumor, inguinal hernia or even a uterine fibroid. Here we report a case of a 32 year old nulligravida who presented with a progressive abdominal swelling since 10-11 months. There was a history of chronic pelvic pain since last 6 months that had increased in intensity since last 10 days. A 32 weeks size mass was detected on per abdomen examination. Ultrasonography (USG) suggested a huge uterine fibroid. It was managed laparoscopically. This huge fibroid was arising from the round ligament and had undergone torsion and was receiving parasitic blood supply from the omentum. The round ligament starts from the uterus, goes laterally into the lateral pelvic wall to reach the pelvic brim. The ligament passes through the internal abdominal ring to enter the inguinal canal and finally ends into the labia majora. Embryologically , it is comparable to the male gubernaculum. 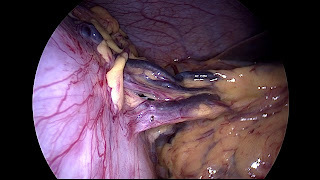 Round ligament pulls the ovaries from the posterior abdominal wall to the uterus. Actual incidence of a round ligament fibroid is not known. It usually occurs in premenopausal women. Various locations of a round ligament fibroid described are abdominal, inguinal and vulvar. In our case it was an abdominal location growing to a very large size. A 32 yr old, unmarried, nulligravida woman came to our OPD with the chief complaints of chronic abdominal pain and a slow growing abdominal mass since 10-12 months. There was chronic pain since last 6 months that had increased drastically since the last 10 days and the abdominal mass had also grown over the last 2 months. She gave no history of any associated symptoms like fever or weight loss or any other swelling elsewhere. On abdominal examination, a hard single smooth mass was palpable which was 32 weeks in size and ballotable. USG that was done showed a large uterine fibroid of 16 x 18 cm. A laparoscopy was done after preoperative evaluation. 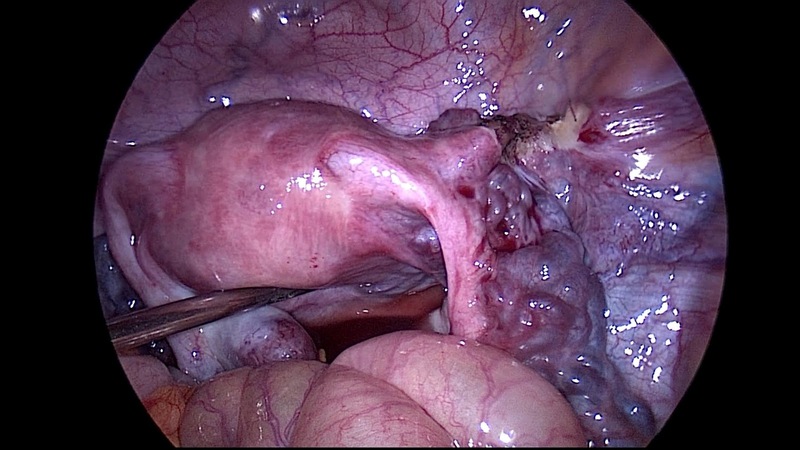 On laparoscopy a huge fibroid like mass of 32 weeks size was seen. It was arising from a pedicle which originated from the right round ligament. Also it was seen that the pedicle from which it was arising had undergone torsion which may have increased the severity of pain in the last 10 days. Another unusual feature which was encountered was that the fibroid which had gained such a big size had developed a parasitic blood supply from the omentum. 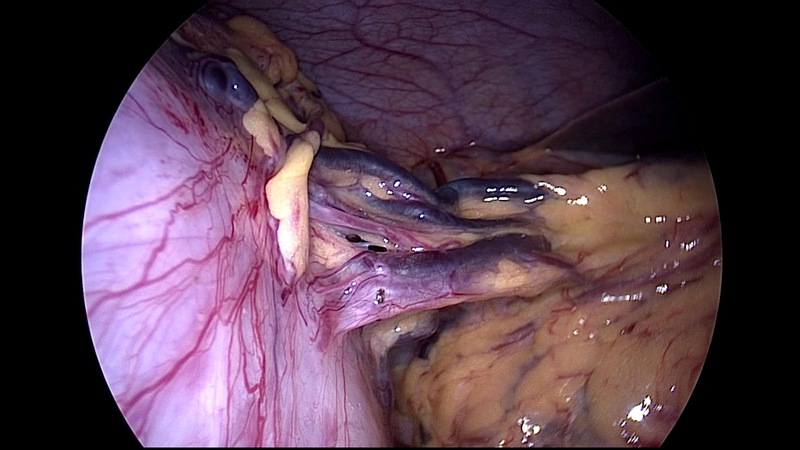 Big blood vessels were seen entering the fibroid from the omentum. The pedicle was coagulated with bipolar energy source and cut with harmonic. The parasitic blood supply was also coagulated with bipolar cautery and cut with harmonic. Due to the use of bipolar cautery, there was no bleeding encountered at the pedicle nor at the omental blood supply. The fibroid was later removed by plain morcellation. Histopathology report showed whorled (fascicular) pattern of smooth muscle bundles separated by well vascularized connective tissue which was consistent with a leiomyoma. There was no atypia, mitotic figures or necrosis. The formation of a fibroid from the muscular fibers of the female genital tract are caused by the somatic mutation of the smooth muscle. While estrogen is a major promoter for the growth of a fibroid, the role of progesterone is still unclear in the management as both the receptors are found in the round ligament. Rarely, fibroids gain an auxiliary blood supply from the surrounding structures like the omentum, broad ligament or abdominal wall. Clinically, such large masses may present pressure symptoms by compressing either the bowel or bladder, ureter producing varying degree of outflow obstruction. On sonography, a fibroid usually shows a whorled appearance which varying echogenicity depending upon the degree of fibrosis, degeneration or calcification. Sinha et al had reported a case of parasitic myoma under the dome of the diaphragm. Complete surgical excision is the only definitive treatment for extra uterine fibroids. In cases where there are huge masses, it is usually difficult to have an exact diagnosis by clinical judgment or radiological imaging. Diagnosis is mostly made intraoperatively. Zaitoon et al reported a parasitic fibroid in a 40 year old female without any previous operation.. Extra uterine fibroids are a rare entity. Even though they are benign, large masses can sometimes mimic ovarian tumors or uterine tumors and pose a diagnostic challenge. Diagnosis can be achieved by sonography, CT scan or surgical exploration. A differential diagnosis of a round ligament fibroid should also be kept in mind when dealing with large pelvic masses mimicking uterine or ovarian tumors. Surgical excision provides a symptomatic relief to the patient and an exact diagnosis and nature of the mass can be found out. Lösch A, Haider-Angeler MG, Kainz C, Breitenecker G, Lahodny J.Leiomyoma of the round ligament in a postmenopausal woman.Maturitas. 1999;31(2):133-5. Warshauer DM Mandel SR. Leiomyoma of the extraperitoneal round ligament: CT demonstration. Clin Imaging. 1999;23(6):375-6. Smith P, Heimer G, Norgren A, Ulmsten U. The round ligament: A target organ for steroid hormones. Gynecol Endocrinol. 1993;7(2):97–100. Sinha R, Hegde A, Mahajan C. Parasitic myoma under the diaphragm. J Minim Invasive Gynecol. 2007;14(1):1. Sewell CA, Russo ML. 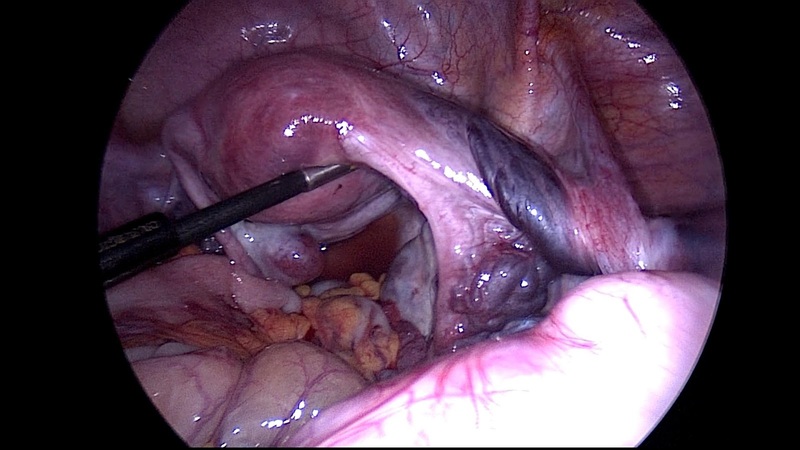 Retroperitoneal leiomyoma: a case report. J Reprod Med 2011;56(11-12):515–17. Zaitoon MM. Retroperitoneal parasitic leiomyoma causing unilateral ureteral obstruction. J. Urol.1986;135(1):130–131.